The New Control Panels are designed for high horsepower equipment in hazardous locations. The panels are installed in a non-classified area and wired to NEMA 7/9 operator station. These explosion proof panels are manufactured for Class 1, Division 1, Groups C & D and the color display helps in displaying agitator speeds, loads and temperature buttons. The product features start/stop push button controls, speed control potentiometers, emergency stop button, intrinsically safe barriers and matching terminal strip. SAVANNAH, GA – November 12, 2018 – ROSS Systems and Controls (SysCon) offers new specialized control panels for use with high horsepower equipment in hazardous locations. A NEMA 12 main power panel, housing high voltage Variable Frequency Drives and motor protection fusing, is installed in a non-classified area and wired to a NEMA 7/9 operator station. In the pictured system built for a 500-gallon Multi-Shaft Mixer, the explosion-proof panel is designed for Class 1, Division 1, Groups C & D and features a user-friendly color display for viewing agitator speeds, loads and temperature, Start/Stop push button controls, speed control potentiometers, Emergency Stop button, intrinsically safe barriers for temperature probe and safety switches, and a matching terminal strip to mate with the main power panel. Ross SysCon is a full-service machine and controls fabrication facility. 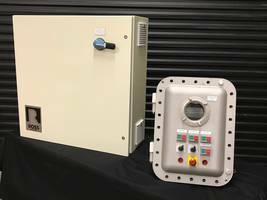 It employs a diverse group of veteran process control engineers, designers and programmers with decades of experience building custom control panels, HMI, PLC controls, recipe systems and SCADA packages.